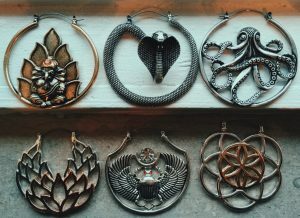 We’ve put together a Holiday Gift Guide to help you choose gifts for those in your life that love body piercings. Each of our stores have extensive jewelry options but we’ve narrowed it down to some of our most popular items. Depending on the piercing that the person has, it can sometimes be difficult to purchase jewelry if you’re not sure of the gauge, length, or diameter they may need. In these cases, we recommend a gift card instead of jewelry because we do not do any returns or exchanges on body jewelry. 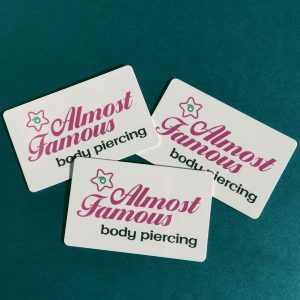 We are running a special on gift cards for the month of December so it is also a great time to purchase a gift for someone that has been wanting a new piercing! When you purchase a gift card of $25, we will give you a free $5 gift card as a thank you! Know someone that has good taste in unique jewelry? Then our hangers are a good choice! You can wear them through a tunnel if your ears are stretched but they don’t require it. 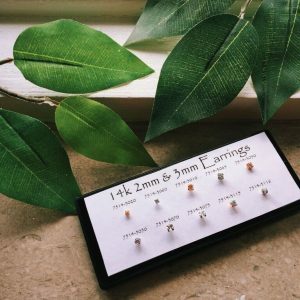 They’re a beautiful alternative to basic stud and clasp earrings and are available in steel, wood, and brass. 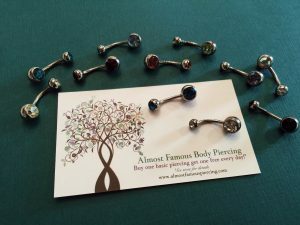 If the special someone you’re purchasing a gift for has their navel pierced, navel jewelry is a great gift option because most navel jewelry fits all. We have anything from solid colored titanium, to colored gems, to dangles of all sorts. 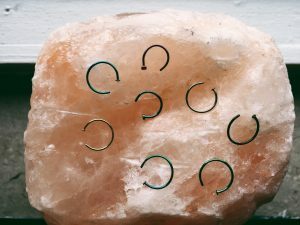 We have a few different styles of nostril hoops but if you’re purchasing a nostril hoop as a gift for someone, we recommend the ¾ hoop option. These are about the same gauge as the average nostril piercing and aren’t a complete circle but rather 3/4 of a circle and available in two different diameters. This is the best option because the hoop can be opened to fit a nostril pierced higher and can also be closed a bit to fit the nostril that requires it. 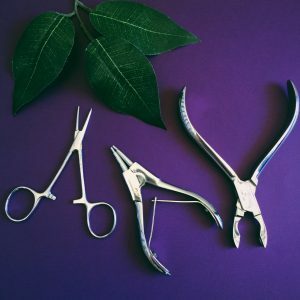 Tools are always helpful for anyone that has body piercings and that likes to change their own jewelry. We sell mosquitos, small and large openers, small and large closers, and gauge wheels. If you’re purchasing gifts for someone that wears captive bead rings, this is an excellent choice. If you’re looking to purchase a gift for someone with stretched ears and know what size they are at, plugs are always a great gift option! 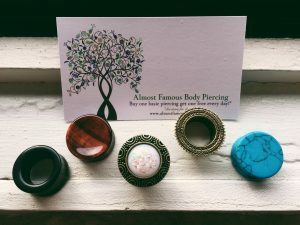 Like earrings, it’s always nice to have many different colors and styles of plugs to wear. We have plugs made from many materials including steel, titanium, stone, wood, brass, and more and are sure to have something for everyone. 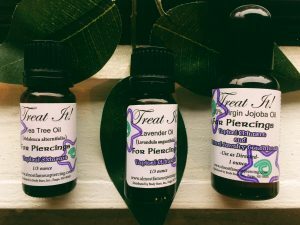 Whether you’re looking to buy a present for a person with stretched ears or just piercings, healing oils are always appreciated. We sell jojoba oil which is a good idea for someone with stretched ears. It helps with skin elasticity by increasing circulation in the lobes and encourages new healthy cell growth. We sell lavender oil as well as tea tree oil to clean jewelry with or even to wear topically. Even if you are purchasing a gift for someone that doesn’t have many body piercings but has their ears pierced, we’ve got you covered! We sell Studex earrings in titanium and 14k gold with a little bit of something for everyone. We have solid colored beads, birthstones, cz stones from 3mm up to 7mm size, and 3 sizes of real diamonds.